A key Trump administration official said on Wednesday that while the attention from President Trump’s recent civil service executive orders focused on disciplinary measures, the president views as equally important the provisions to better reward top performers. 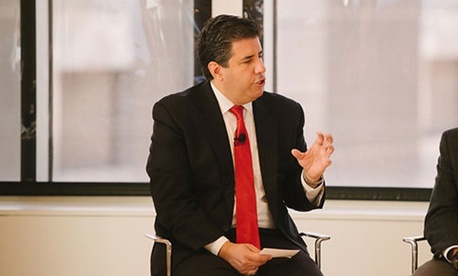 With unemployment numbers so low, competition for talent with the private sector is strong and incentives to recruit and retain employees are more important than ever, Office of Personnel Management Deputy Director Michael Rigas said at a Government Executive event in Washington, D.C. Promoting the administration’s efforts to provide incentives to its best workers—such as its proposed $1 billion workforce fund, which lawmakers declined to fill in fiscal 2018—will prove just as important as those aimed at streamlining the federal government’s firing procedures, Rigas said. The efforts to boost incentives “didn’t get enough attention as managing the low performers did for whatever reason,” Rigas said. He added that they will help recruiting once they get the attention they deserve. He explained that OPM has polled federal agencies outside of the normal Federal Employee Viewpoint Survey to determine how they work through the disciplinary process and found a disparate system across government. “We found there are a lot of processes and procedures that are in place at individual agencies that aren’t required by law or by OPM-issued regulation and this is an effort to streamline,” Rigas said. In a rare concession to federal employee unions, he said official time—the subject of another of Trump’s executive orders—was essential. He also defended a third executive order to revamp collective bargaining between unions and agencies, saying in the current construct “negotiations go on for years.” The two sides should not have to address minute details such as the shape of the table they will be negotiating at before getting to more critical issues, Rigas said. Under the order, which requires agencies to complete negotiations within a year and creates a working group to identify “wasteful” provisions in CBAs and set “model ground rules” for bargaining, Rigas said he expects agreements can be reached in a matter of months. The order prescribes firm timelines for each stage of CBA negotiations: a maximum of six weeks for ground rules negotiations, and four to six months for negotiation of a full agreement will be considered “reasonable.” If an agreement is not reached within these time frames, agencies are ordered to consider going to either the Federal Mediation and Conciliation Service or the Federal Services Impasses Panel for arbitration of unresolved issues. Agencies are required to inform the OPM director of any negotiations that have lasted longer than nine months. Angela Bailey, the chief human capital officer at the Homeland Security Department, said she will work carefully to implement the order while not undermining relationships she has built with unions or longstanding agreements currently in place. Ensuring agencies apply the order uniformly while respecting the “subculture” at each federal office will require a “marvelous balancing act,” she added. “There’s just not one size fits all,” Bailey said.